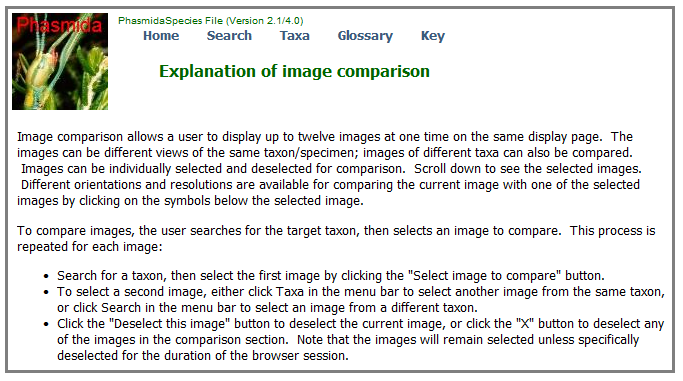 The taxa page is essentially the hub of a species file website application. On the taxa page (Taxa hierarchy as it is formally called), a user may navigate up and down the taxonomic hierarchy via hyperlinks, view detailed information associated with the “current taxon,” and modify how the information is displayed. This section will briefly outline the main navigation features as well as the various data items that can be associated with the current taxon. The discussion will follow in the order of appearance of the various items on the taxa page. How some of the information is displayed and what options are available depend on the user’s log-in privileges. Finally, the options for changing what information is displayed will be discussed. Understanding the importance of the current taxon is key to navigating through the taxonomic hierarchy and recognizing the different types of taxonomic data associated with a particular taxon. 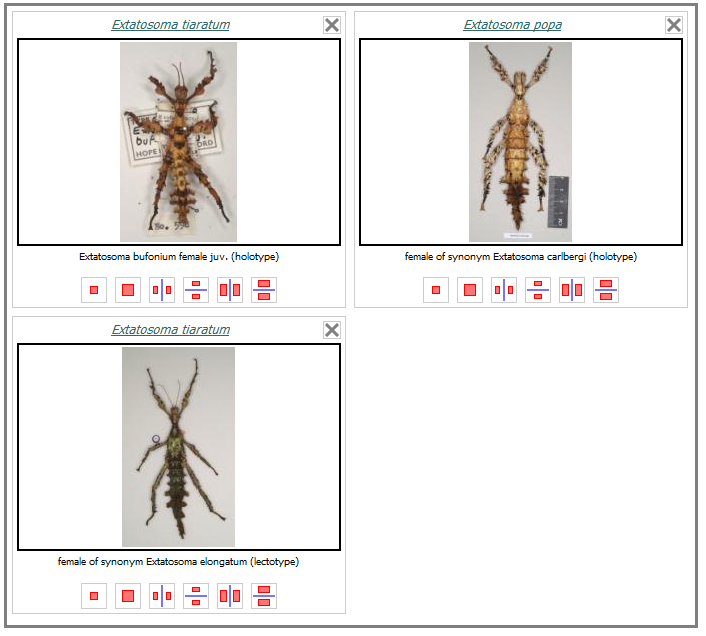 The current taxon (Orthoptera in the above image) is the one that is displayed when Taxa is clicked on the navigation bar. 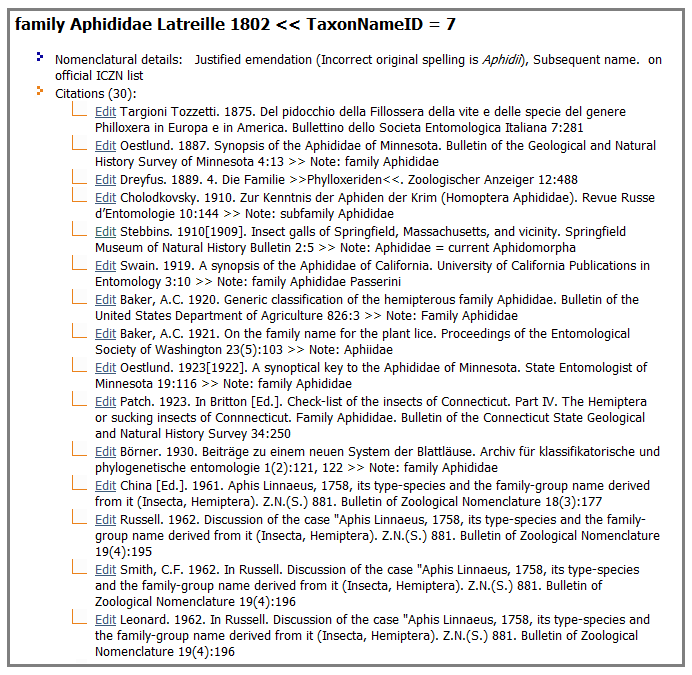 Upon entry to a new species file, clicking Taxa for the first time will display the taxon data for the apex taxon (the taxon at the top of the hierarchy for that species file). After navigating up or down the hierarchy, the last taxon displayed on the taxa page remains the current taxon. If one of the other menu items on the navigation bar is selected, a subsequent selection of Taxa will return to the previous current taxon display. 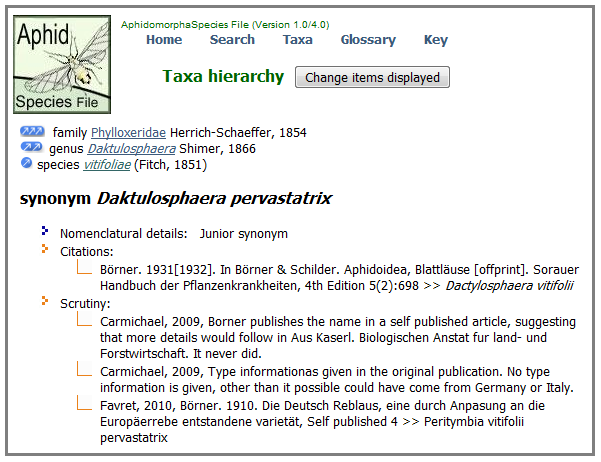 In Figure 1, Orthoptera is not only the current taxon but it is the apex taxon of the Orthoptera Species File as well. Superorder Orthopterida is the parent taxon, cohort Polyneoptera is the grandparent taxon, and infraclass Neoptera is the great grandparent taxon. Clicking one of these hyperlinks will select that taxon as the new current taxon. Please note when navigating to the upper levels of a species file, selecting one of the above hyperlinks may transport the user to a different species file. In the image above, for example, selecting cohort Polyneoptera takes one to the Polyneoptera Species File and selecting infraclass Neoptera takes one to the Arthropoda Species File. This feature of automatic links is optional, but it demonstrates the possibility of seamless navigation throughout all species files. There are many kinds of data that may be associated with the current taxon; some may be simple nomenclatural descriptions or commentary while others may be rather complex objects such as specimen or distribution data. It is rare for a single taxon to have all such associated data, but it is possible. The current status of the taxon is documented by its nomenclatural details. 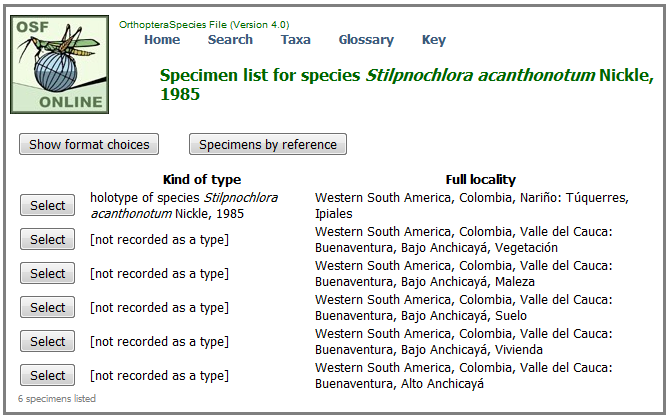 The species file software maintains a table of related taxa based on nomenclatural status. If a related taxon has been specified, it will be displayed along with the nomenclatural information of the current taxon. If the current taxon is a secondary homonym (for example, use synonym Pezotettixschmidti Brunner von Wattenwyl, 1861), the nomenclatural details include: “Secondary homonym (Nomennovum is fieberi), Notschmidti of Fieber.” This example shows that multiple nomenclatural details may be included. The following table contains nomenclatural information in several categories and parenthetically displays the kind of taxon relationship that may be specified. One or more common names may be associated with a scientific name. Not only can there be several names, editors who input the taxon data may create common names in different languages. An editor may add as many different languages as necessary. The set of languages varies from one species file to another. Any type of image may be associated with a particular taxon. An image can be a photo, line drawing, even a replica of a specimen label . 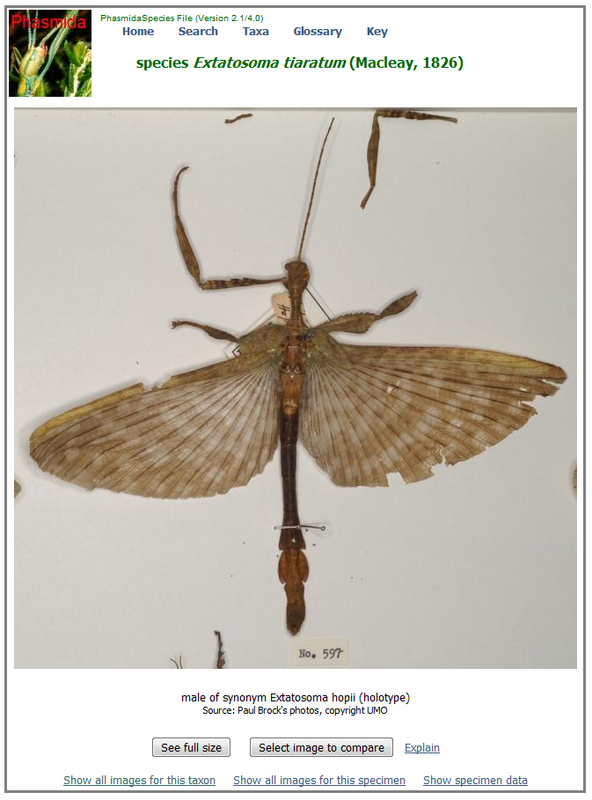 There are 14 images associated with the species Extatosomatiaratum in the Phasmida Species File. 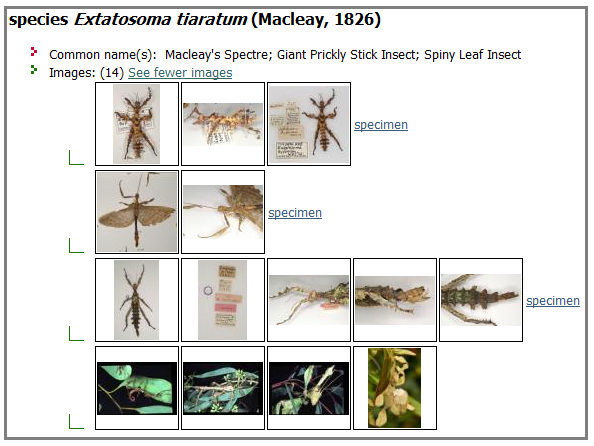 The default setting of images on the taxa page displays only six images. The order in which the images are displayed is determined by the person who entered the image data. Clicking on the “See all images” hyperlink displays all of the images associated with this taxon. In this expanded image display, there are three rows of images. The hyperlink “specimen” appears after all images associated with a specific specimen record. Hovering over the “specimen” hyperlink displays the specimen ID. [I guess we’re not hiding all IDs for the public user.] The hyperlinks allow the user to access the specimen data directly. The maximum number of images per row is six. There may be taxa with seven or more images associated with the same specimen record. In this case, the hyperlink “specimen” appears after each row of images but will go to the same specimen data display. Note the last four images are not associated with a specimen. In the following figure, there are three images selected for comparison: Two from Extatosoma tiaratum (one is actually the lectotype of a synonym) and one from Extatosoma popa. Sound recordings may also be associated with a particular taxon. This is particularly useful for the study of taxa whose calls or songs distinguish one species from another. Audio data was particularly important for the Orthoptera Species File, the first species file developed . One or more links to other websites can be associated with the current taxon. 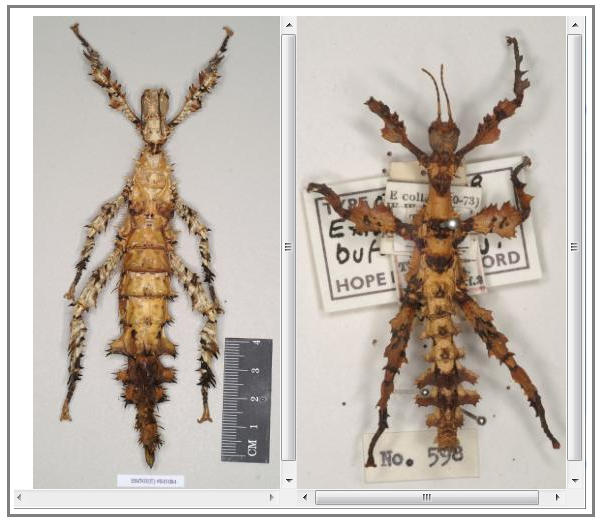 In this case, Alloperlaroberti (from the Plecoptera Species File) has links to two websites: The first is to an entomological site at Harvard and the second is to the IUCN list of threatened species. Clicking either link opens a new browser window and displays a web page pertaining to Alloperlaroberti. 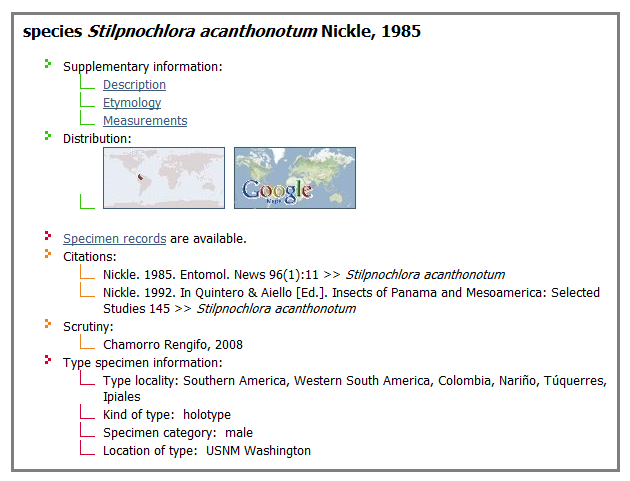 There are three records of supplementary information for Stilpnochloraacanthonotum. Since a taxon may have any number of supplementary information records, separating the data into discrete records with a descriptive title is quite useful. Clicking on Etymology displays the following supplementary information. There are three records of supplementary information for Stilpnochlora acanthonotum. Since a taxon may have any number of supplementary information records, separating the data into discrete records with a descriptive title is quite useful. Clicking on Etymology displays the following supplementary information. The bold headings Content, Source of information, and Date last modified are part of the supplementary information template. Distribution data displayed in map form can be represented in two different manners depending on what kind of data there is: Shade maps and Google maps. 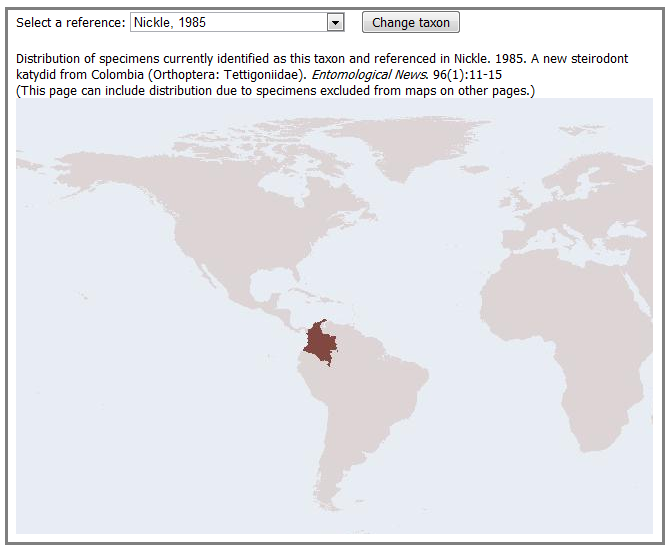 Maps do not contain data for invalid or extinct taxa. Maps of higher level taxa, e.g., genus rank, aggregate the distribution data of its subordinate taxa. Shaded maps: These maps include distinct shading for TDWG geographical levels 1 through 3. Origin of the distribution data is threefold: Specimen data that include the TDWG classification, references that specify locality data, and manual entry. Determination of the completeness of the data is also included. The following partial display shows a drop down list to select one reference that contains distribution data. Since distribution for a single taxon can be from multiple sources, including multiple references, showing the distribution based on a single reference may be useful. Google maps: A Google map application shows points on a map based on latitude and longitude contained in specimen data. 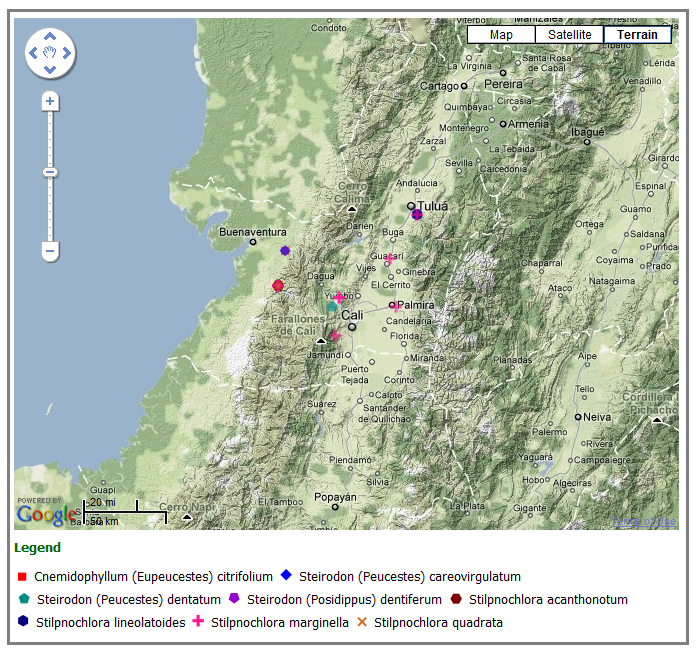 The legend contains multiple specimen locality data. 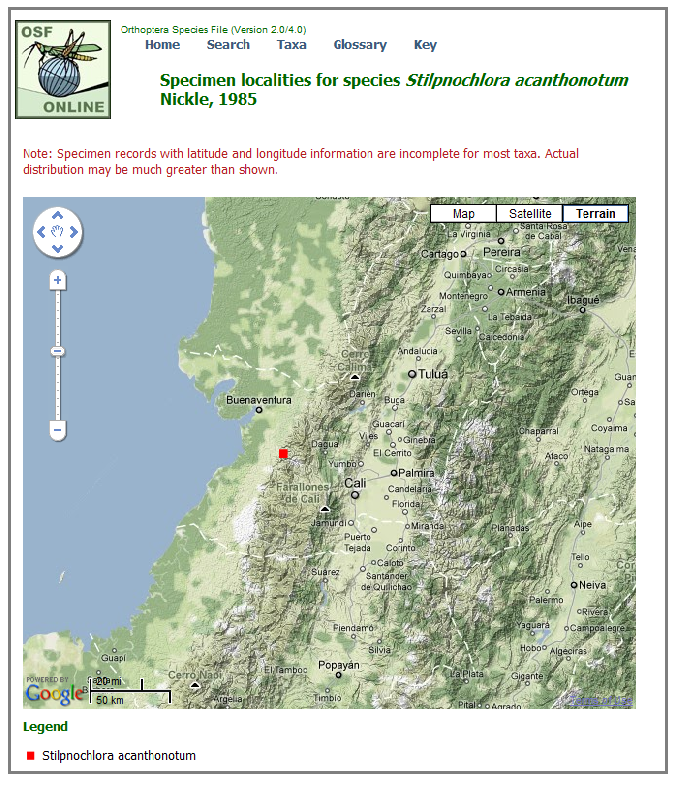 The standard features of Google maps is fully implemented in the species file web application. Specimen data is displayed in two different ways for species with type specimens of primary types (holotype, lectotype, etc.). 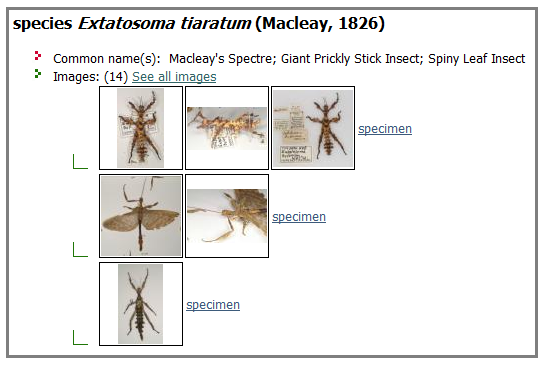 Most specimen data of primary types is summarized on the taxa page. Please refer to the “Type information” section below (hyperlink). 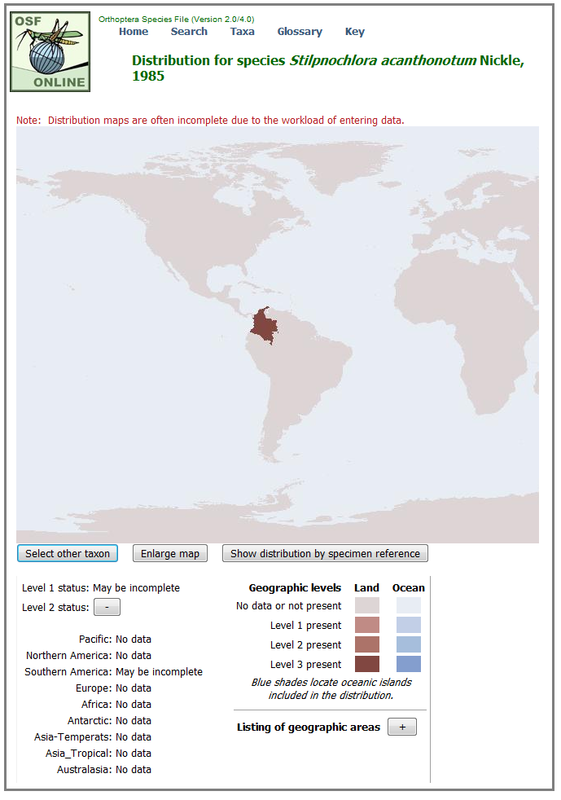 In the following image just below the distribution maps, there is a hyperlink to list the specimen records associated with the current taxon. Selecting the “Specimen records are available” hyperlink opens the door to presenting the specimen data in greater detail than the type specimen summary recently referenced. In this case there are six specimen records, one is the holotype and the others detail different localities where the specimens were found. The “Show format choices” button allows a user to select which specimen attributes should be listed in the specimen list. In addition to the specimen’s identification, the specimen record contains physical information such as counts, where specimen is deposited, source of data, catalog number, preparation type, specimen status or condition, and a descriptive note that might contain useful information not found anywhere else. There is no editor requirement to supply all of these items. Information about where the specimen was found, its geological age, who collected it, when it was collected can also be included. If the TDWG geographical data was entered, the data will be represented on the distribution shade map. If latitude and longitude was entered, the Google map will pin point the locations. [Refer back to distribution section.] Images and sounds may also be associated with the specimen. 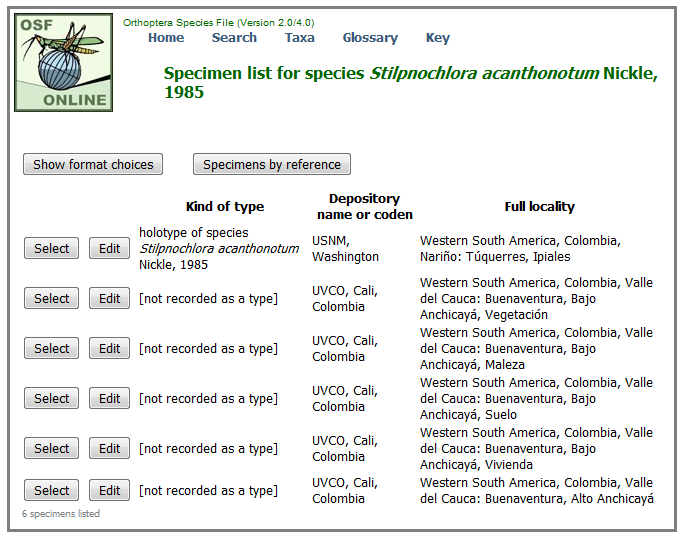 The Species File Software allows editors to create ecological relationships at both the taxon and specimen levels [need to find examples of both to show user interface to display this information]. At the specimen level, the relationship might be between an ant-loving cricket that was found in the ant’s nest, a plant that was eaten by the specimen, or the specimen was found inside its host. Literary citations provide a taxonomical historical record. To digress a moment, the Species File uses certain common terms in a specific and distinctive way: •	Publications are scientific journals, books, dissertations, sometimes unpublished sources – anything that has been printed, a physical exemplar. The definition of publication has been extended to include electronic material. •	Referencesmay contain author(s);actual and stated (if different) date of publication; title;the publication name; series, volume or issue (if applicable); page numbers; editor notes; and a website link that contains the reference article. References can also contain other references; e.g., Jones in Smith and Jones, etc. •	Citations may contain a reference, nomenclator information for genera and species, the cited page number(s), editor notes, and information content (nomenclatural status or type, taxon concept changes, and other information such as classification, ecological data, specimen, key, physiology, etc.). A taxon can have up to three scrutinies. There is no predefined format for a scrutiny; it is basically a note field where an editor can make comments about the taxon, the literature, status of new work, etc. In the case of synonym Daktulosphaera pervastatrix, it has the maximum number of three scrutinies. If the editor or database custodian wants to add a new scrutiny, a history of scrutinies can be maintained in the supplementary taxon information [hyperlink to this discussion above]. Depending on rank of the current taxon, type data is summarized for the type specimen, type species, or type genus. The type information for this subfamily in the Phasmida Species Files is complete in that it lists the type genus, the priority for the name (and therefore authorship), and the first use of the current taxon spelling. 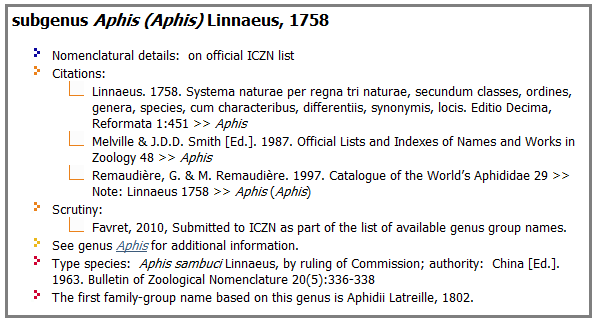 Note that Pachymorphae Brunner von Wattenwyl 1893 is listed as a synonym of Pachymorphinae since the ICZN code requires a properly latinized replacement name with appropriate suffixes (e.g., -idae, -inae, -ini, etc.) for family-group names published before 1900. 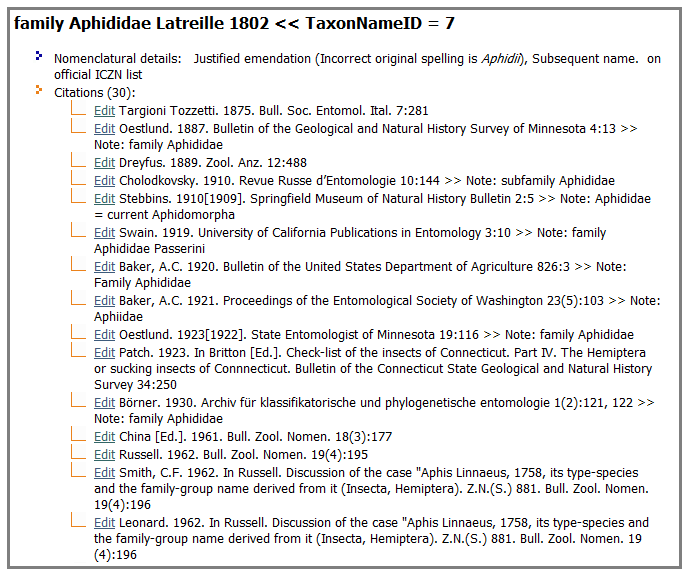 This example type species from the Aphid Species File illustrates how slightly unusual (need better phrase?) data can be handled in the species files. In this case, the fixation (proper usage?) of the type species was determined by a ruling of the ICZN. And since the first family-group name based on this genus is AphidiiLatreille, 1802 (currently a synonym of family AphididaeLatreille, 1802), Latreille is the author for all family-group names based on the genus Asphidii. 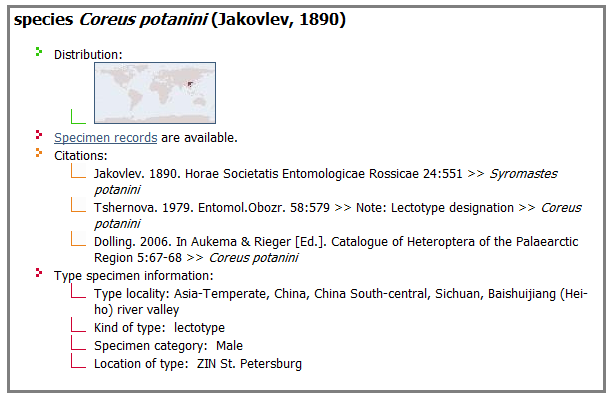 The summary of type specimen information for species Coreus potanini (Jakovlev, 1890) in the Coreoidea Species File contains the locality, kind of type (holotype, syntype, etc. ), gender, and specimen depository. Sometimes not all of this information is available. Normally, there is a summary on the taxa page for the type specimen, which is considered to be a primary type. Primary types include holotype, syntype, neotype, lectotype, and “unspecified primary type” (for those cases where the kind of type is unknown but presumed to be a primary type). 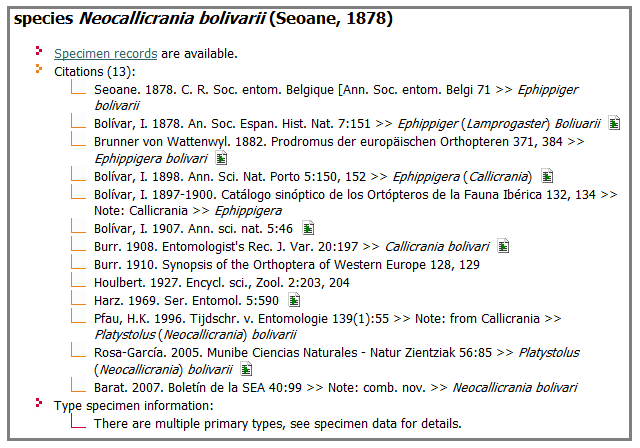 In the example of Neocallicrania bolivarii below, the type specimen information summary indicates there is more than one specimen record containing primary types. 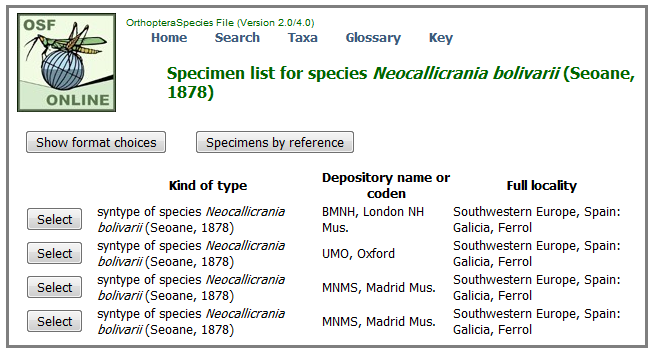 There are four specimen records of syntypes for Neocallicrania bolivarii currently located in three different depositories or museums. 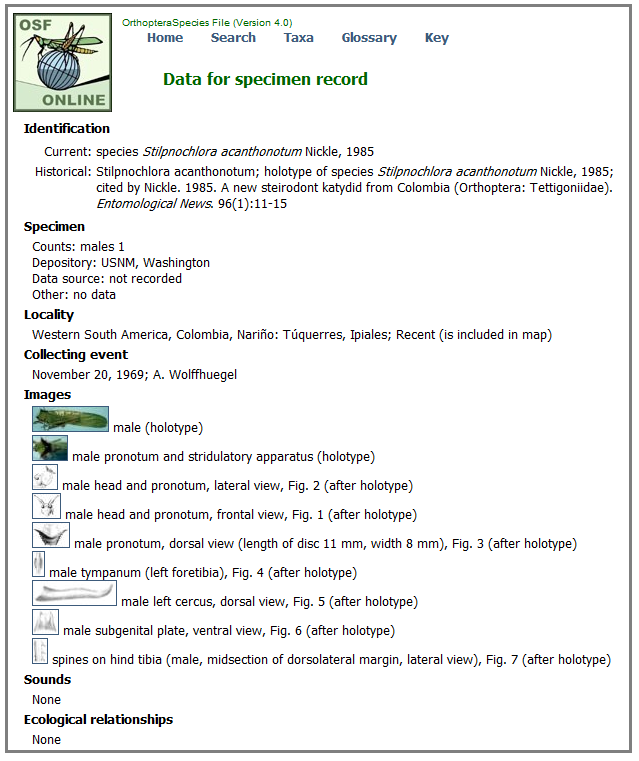 By selecting one the of the specimen records, the specimen data is displayed. 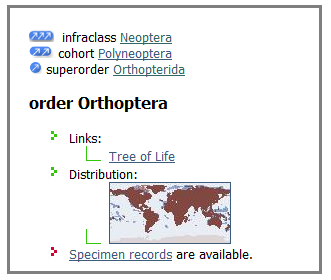 Up to three levels of subordinate taxa can be displayed as the last data item on the taxa page. (The default number of display levels is two, but this can be modified in the “Change items displayed” discussion below.) Click on the desired taxon name hyperlink to navigate down the hierarchy. It is always possible to select one of the current taxon’s parents to start down a new branch. To see the default display specifications, click on the “Change items displayed” button. Many of the options are straightforward. Here is a brief explanation of those that might not be. •	Subordinate taxon levels. The user may not want to navigate to subordinate taxa, in which case zero levels may be selected in the drop down list. The maximum number of subordinate levels is three. •	[hyperlink to here from citations discussion) Long form vs. short form refers to how citations are displayed. In short form, the reference title is not displayed and only the abbreviated publication name is listed. Long form contains the full reference title and full publication name. 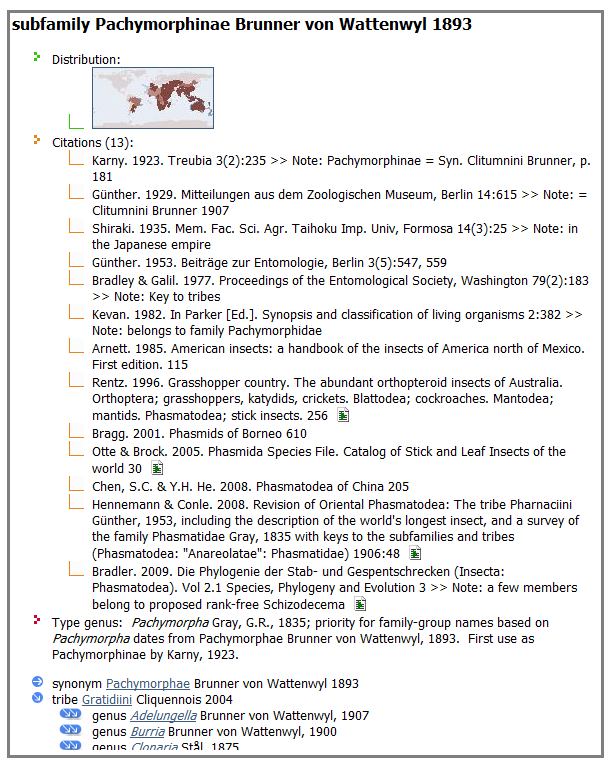 •	Displaying taxonomic data for not only the current taxon (default) but for all subordinate taxa can be a useful tool for studying a specific part of the hierarchy. Whatever display specifications are selected will also be displayed for the subordinate taxa to the specified number of levels. The following two screen images of genus Apotrogia Kirby, 1900 (Blattodea) illustrate this option. Taxonomic information is displayed for the current taxon only. In addition to selecting the option to show information for the current taxon and all subordinate taxa, the display of synonyms was suppressed. Therefore, taxonomic data for synonyms Acanthogyna Chopard, 1927 and Thaumatoblatta Hanitsch, 1950 is not displayed (nor the two synonyms Acanthogyna deplanata Chopard, 1927 and Thaumatoblatta leonhardi Hanitsch, 1950 of Apotrogia angolensis Kirby, 1900). The next section is a checkbox list of data items that can be associated with a taxon. Three items of note: •	As was discussed in the Images section [hyperlink? ], the user can specify all images to be displayed or only the first six images. The default image display is six images. •	Taxon history: Under development. If the taxon history checkbox is checked, the resulting display may change from time to time. For a list of what information is tracked in taxon history, click here [HYPERLINK to Taxon History section, about page 29] •	If the citations checkbox is checked, the user has additional options in the next section to filter the types of citations to be displayed. Note regarding citation display options: Regardless of which citation radio button is selected, if the user checked any content checkbox and selected a short or extended description, the content specifics will be displayed. The buttons at the bottom of the page allow you to reconfigure preferences, reset to previous, and submit the changes for this session or all sessions. How does it remember your preferences for future sessions? Good question. 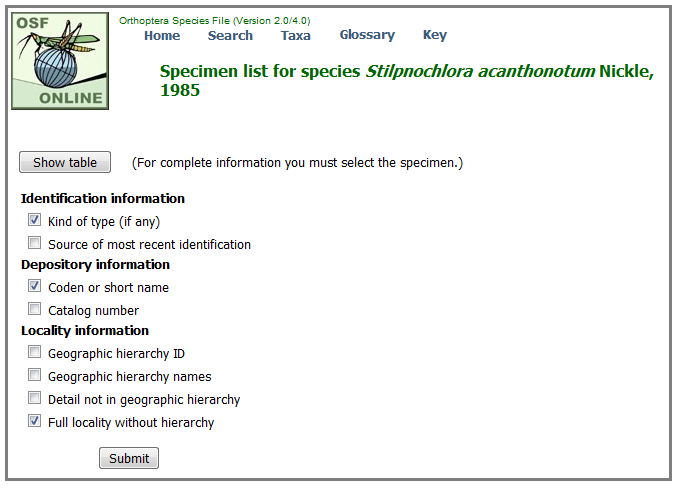 Better answer: Create a log in name by clicking on the species file logo at the top of the page. Click on the new user login hyperlink to create a login name and password. By creating a log in name, the user can select personal settings to be used when viewing the taxa page that will remain in effect from one session to the next. These can be changed whenever there is a requirement to focus on a small subset of taxonomic data relevant to the current task or whatever data filtering is required. Experimenting with the settings is the best way to become familiar with the options. This page was last modified on 14 February 2013, at 17:00. This page has been accessed 86,662 times.